The Society for the Advancement of Material and Process Engineering (SAMPE) is an international organization devoted to the promotion of technical excellence in material and process engineering, totaling more than 4000 engineers, technologists and materials scientists. It has been founded in 1944 by Californian aerospace engineers with the goal to build a professional network and improve the exchange of technical information. Since those times SAMPE has spread all over the world and is divided in about 40 chapters. SAMPE has also achieved an international reputation as a registered private body. The Benelux SAMPE Member Association (SSC) has about 180 members, originating about 3/4 from industry and 1/4 from academia. 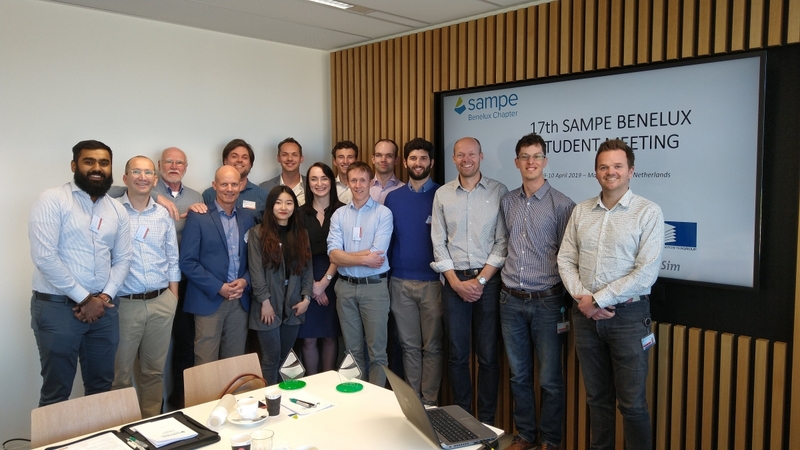 This year the SAMPE Benelux 2019 Students' meeting was held on the 9th of April 2019. Excellent students in materials or process science and engineering in their final year of the BSc or MSc programs (at moment of selection) and PhD students in the middle of their project were invited to participate in our annual Sampe Benelux Students meeting to present their work. The winning students were allowed to present their work the next day on the SAMPE Benelux meeting at NLR in Marknesse and are given the opportunity to represent the Benelux chapter at the SAMPE Europe 2019 International Students' Seminar. Frequent Q&A are available for download! Visit the article for the link. Subscriptions for enthusiastic student groups who want to win the SAMPE Benelux contest are CLOSED!